You just don’t see things like this anymore. What we have here are two original graphite pencil concept drawings and original typewritten three page storyline synopsis for the second ever Kiss comic (if you don’t count the Howard The Duck appearances). The story, The Land Of Khyscz, appeared in Marvel Super Special #5 in December 1978, at a time when Kiss were starting a rapid downslide in popularity in the USA, mainly on the back of the so bad it’s bloody funny movie, Kiss Meets The Phantom Of The Park. 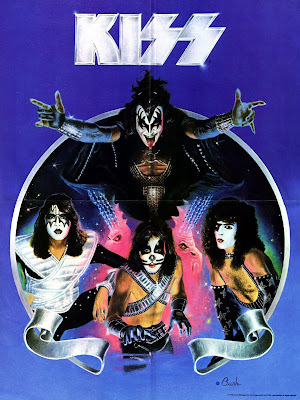 Well, the original cut of the movie was so bad it wasn’t funny, when it was recut for the cinemas here in Australia and released as Kiss Vs The Phantom Of The Park, with different scenes and better music (i.e., not stock music from bad 1960s movies, but actual Kiss and related songs) which is why I suspect that it ended up on the second volume of their Kissology DVD series instead of the original, but there you go.